I am going to admit something. I have developed a love affair with my alcohol inks. These little beauties are so vibrant and permanent! Love it! With the holidays approaching quickly, I wanted to make up some gift tags. They turned out so fun I had to share! If you are brave, you might try this with your kiddos. The ink is super permanent so fair warning. I know, I know… It’s not Monday… but I couldn’t wait! 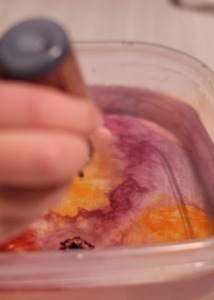 Alcohol inks do various colors. They come in packs of 3 so that’s an easy place to start! A deep dish filled with water. Be sure it is long enough to fit the full length of your item. A place to let them dry. So fun and so super easy! Take these beauties and embellish with ribbon, glitter, stamps… Cut them up for an art journal or mixed media piece… So many ideas! Just have to be a proud mom for a moment. My daughter helped me make some to sell for Christmas present money. Today as she took them to school, she said “Mom. I am going to try to sell these and then give the money to the Make a Wish fundraising jar at school.” Go for it kiddo… That’s what this season is all about! Hope you have fun crafting! Very crafty this fellow Blogger is! Oh boy… if you enjoy letting your materials do some of the work for you, you will love these beauties! Rich and vibrant! Thanks so much for your kind words!!! Wow, what a great idea! 🙂 I have only one colour at the moment, but I really NEED to buy a few more ASAP! I just LOVE alcohol inks and try regularly to find new ways to use them. This was so much fun you will HAVE to give it a try!!! Please be sure to come back and post if you make something!!! will do 🙂 I hope to have a trip out to buy alcohol inks shortly! !